Our 3" x 3" Linear LED Fixture features an ultra-efficient optical lens that allows you to get the lumens where you need it. Compare to Linear High-Bay Lighting, our 3" x 3" High Optical Performance Fixtures are available in (3) Light distribution patters: 30 degree, 60 degree, and 90 degree FWHM. These optical characteristics make this an excellent replacement for old and inefficient industrial lighting systems. Optical efficiency means that no lumens are wasted in areas where they do not need to be delivered. Common applications for this type of lighting are industrial and commercial spaces; manufacturing plants; labs and schools; etc. 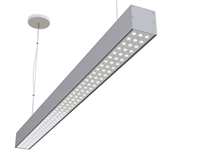 Our 3" x 3" HOP (High Optical Performance) Linear LED Lights are available in (3) attractive color temperature options: 3000K Warm White, 4000K Natural White, and 5000K Bright White. 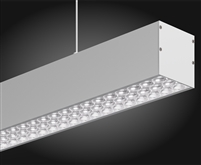 They can easily be cable, suspension, pendant mounted from any surface: high-bay, t-bars (drop-ceiling), drywall/concrete, etc. Need a Custom Linear Light Fixture?